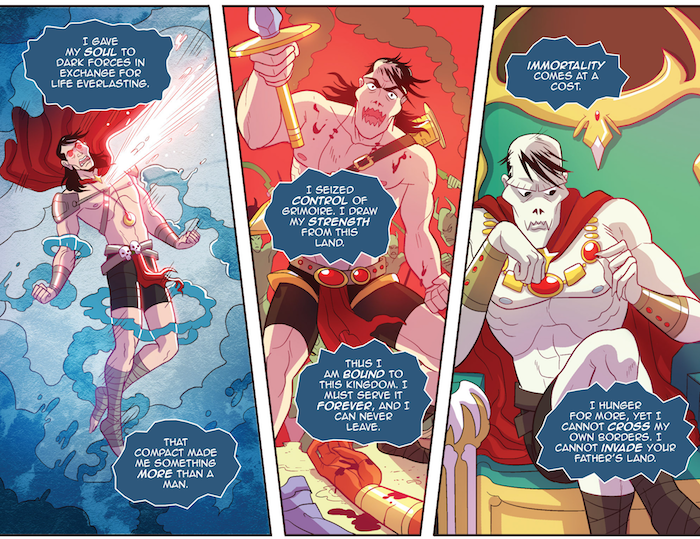 Oni Press snuck this one past us like oh so many Koopa shells gliding along on the bricks of life. Another Castle is a limited series that puts the princess in a power position, gives her agency against her captors and ensures that she doesn’t need someone to fight her battles for her. While the title references a familiar plumbing video game, what is happening in Another Castle is much more than a retreading or adaptation of a video game story. This fun and positive fantasy adventure is as much about solving problems as it is about empowerment. 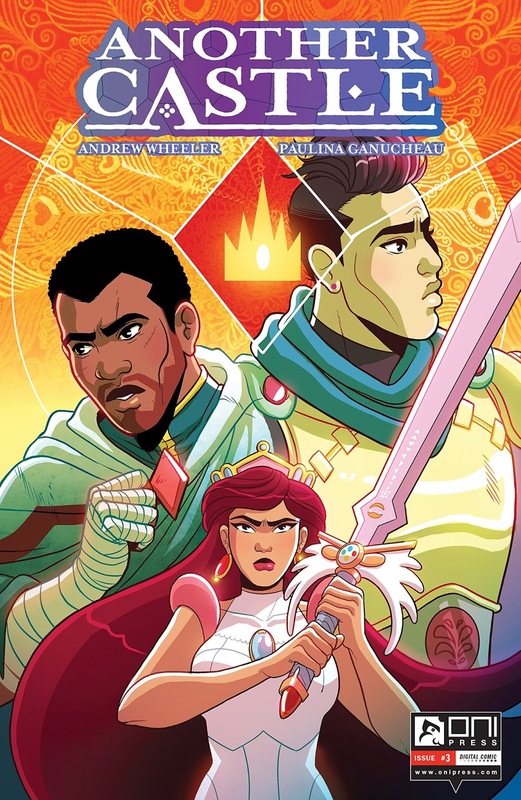 The creative team of Andrew Wheeler (ComicsAlliance.com) and Paulina Ganucheau (Zodiac Starforce) took some table time away from commerce at Emerald City Comic Con to tell us what to expect in the coming issues as well as entice some new readers into Another Castle! FOG! : Another Castle has been a great adventure story so far. We have some video game influence, D&D and scary monsters and bosses! What’s a quick pitch to get people into the book? Andrew Wheeler: A fan at Emerald City Comicon this past weekend described it as “Lara Croft as a princess”, which is a pretty cool description! I’d call it a damsel-in-distress story where the damsel can save herself, but she’s determined to save everyone else as well. Paulina Ganucheau: Whoa I love that description! So cool and accurate. Misty isn’t your typical princess, as in she doesn’t need some plumber or her beau to come save her. Why is it important that she take fate into her own hands? Andrew: She’s a hero, not a trophy for someone else to win. If you’re going to flip something as familiar as a save-the-princess story, it’s not enough to show that Misty can take care of herself; we had to show that she’s willing to take care of others, even if it means making sacrifices. Paulina: Agreed. She’s more than just a princess that can fight. She’s thoughtful and understands how to handle situations in a way she would handle them. Not the way a quintessential hero would. She’s her own type of hero. How did the creative team get together on this, and what is the relationship with the team and Oni Press? Andrew: Oni put the team together, so Paulina and I are indebted to them for that! I came to Oni with the pitch for Another Castle, but no artist. They had the perfect artist to bring to life a bright, beautiful fairy tale kingdom and a tough-as-nails princess in a pink dress. Paulina: Yup! And what a team we make! I’m so happy to be collaborating on this book with Andrew. We’re really creating something special! Badlug made a series of choices to get him to being the creep that he is today. Will we see more of what made him this way? Andrew: This isn’t his story, but you will see a little bit of why he thinks what he’s doing is justified. I think it’s important, as a writer, to know who your villain is and what makes them tick. But I also need to know how much time the audience needs to spend with that guy, and in this case I don’t want the audience to get too cozy with him. Paulina: I will say I do really enjoy drawing that evil turd though. Gorga and Fogmoth work for Badlug but are trying to help Misty and Price Pete as much as they can with the powers they have available. What will happen when Badlug finds out? Andrew: Oh, he’ll chop off their heads, for sure. It’ll be a very sad issue. Paulina: ANDREW, NOOO! I will save them you guys, don’t worry. There seems to be a ‘Boss’ video game structure to the enemies Misty must face. Will her experience help her get through the sticky spots? Will she be reunited with her sword The Leveler? Andrew: I can’t give too much away, but Pete’s actually the one facing the traditional boss fights on the road to Grimoire, and… this isn’t his story either. 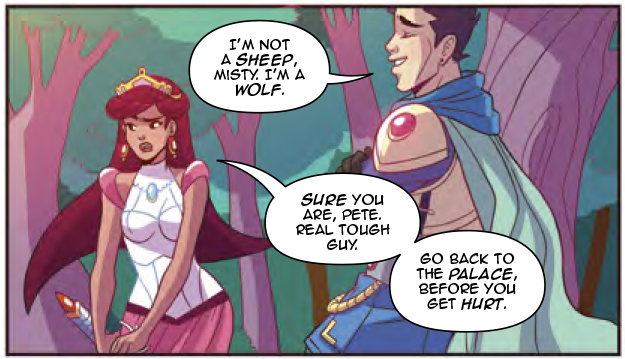 But he has to get to Grimoire to get the sword to Misty, so you’ll see in issue #2 how Misty plans to help win those boss fights on Pete’s behalf. Paulina: I can’t wait for you guys to see more! A lot of praise for the book is for empowering Princess Misty and turning the damsel in distress trope on its ear. How are you doing that and why is it so important? Andrew: The idea that drives all my stories is that everyone should be able to see themselves as the hero of their own story; not just the straight white guys. That allows people to understand their value, and the value of the choices they make. So if you look at the damsel in distress and ask yourself, what’s her story, and how can she be the hero, you get something like this. Misty isn’t playing a supporting role. She’s making her own choices. She knows her own value. Paulina: Andrew said it right! What is the most fun part of creating this book? Andrew: Working with Paulina, and seeing her bring this world to life! I really couldn’t ask for a better collaborator for this beautiful world of monsters and heroes. It’s especially fun discovering all the little details that she adds in the backgrounds that weren’t in the script, but always fit so perfectly. That’s how I know she and I are building the same world! Paulina: Aw, Andrew! Well, my answer is similar. I love building on this lush interesting world Andrew has laid out. Every time I read a new script I can already visualize what I want to see when I put pencil to paper. The world is so vivid in my head and it’s all thanks to Andrew’s writing. Also designing the characters was so so fun. That’s always such a fun step for me with comics. One last question, answer honestly. Your desert island NES video game: Zelda or Mario? (or is it Kirby)? Andrew: I’ve got to say, as the title of the book suggests, I’ve a longstanding affection for that little Italian plumber and his goofy little yelps and his silly little costumes. But my real and potentially heretical answer is that I grew up a Sega kid, so I’d trade in the Nintendo for a Genesis and play me some Sonic. Paulina: Andrew, boohoo! No I’m kidding I’m kidding!! I’m a total Nintendo fan girl so this is a toughie for me, but I will have to go with Mario. I can pretty much always play a Mario game. And I’m pretty good at them! All the games where Peach is a playable character option are honestly my favorite games tho. Go figure right?